Download our rules leaflet (pdf) or read the full rule set below. Here’s a full version (pdf) in French. ARC-mage or simply 'arcmage' is a card game with free (downloadable) cards. Each card in the game belongs to a specific faction. The factions are: Gaian, Dark Legion, Red Banner, House of Nobles, The Empire. Each card has a card type: city, creature, enchantment, magic, or event. Each player builds a deck of exactly 45 cards. To play arcmage you need a few things. A deck of cards (see #Deck Building). You can download the cards individually or get the pre-constructed decks, then print, cut and sleeve them. A set of faction counters, each distinguishable from the others. One counter for each faction in your deck. For example, a green counter for Gaian, a black for Dark Legion, a red for Red Banner, and white for the Empire. Building your deck well is vital to success in the game. Players build their decks according to their personal playing style. Your choice of cards dictates your options during the course of the game, and directly affects how well you might fare against your opponents. As the game proceeds you will draw a given number of cards from the deck almost every round. The deck is shuffled at the start of the game, so you seldom know what cards you might draw. Usually, you would want to have a deck prepared before you sit down to play a game. Every deck must contain exactly 45 cards. The deck may contain cards from any combination of one or more factions, and any mixture of card types. At least 3 of the 45 cards must be city cards. A deck may only have up to 3 copies of a card. Cards are considered copies if they have the exact same card name. Every card in arcmage may be added to a deck (subject to these deck composition rules). In cases where all remaining players are defeated at the same time, the player with the most cities in play wins. If more than one player has the greatest number of cities in play, the game ends in a tie. During the game, you can put a card from your hand face down on the table and turn it into a resource card. Resource cards are necessary to play cards from your hand. The card becomes a resource card for a faction of the player's choice. The faction of the card does not have to match. Multiple resource cards for the same faction are grouped together, and placed near the faction's resource counter. All unmarked resource cards indicate how many resources are available for use in the current turn. All marked resource cards indicate how many resources have been consumed in the current turn. The convention for counters used for resource cards is: Green for Gaian, Black for Dark Legion, Red for Red Banner, Blue for House of Nobles and White for The Empire. Available (unmarked) resource cards are necessary to play cards from your hand. Let's look at a typical card layout. Faction Logo: The Faction logo shows which faction the card belongs to - in this case the Red Banner faction. Loyalty Marks: The loyalty marks indicate how many resource cards of the resource cost must be paid using the faction's own resources - in this case 2 red resources for the Red Banner faction - , the remainder of the resource cost can be paid using any kind of resources. Card Art: The illustration has no impact on game play. The card art is merely for aesthetics, lending to the game's theme and setting. It also helps players quickly identify and remember cards. Card Name: Every card has a unique name. Card Types: This line contains the types(s) of the card. Each card type is governed by specific rules, and are usually related to rules found on other cards. Coloured Border: The border around a card reveals what faction it belongs to. 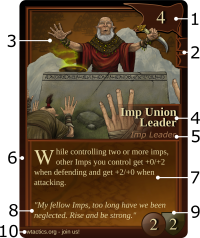 In this example, the Imp Union Leader card has a red surrounding border, revealing--together with the faction logo--that this is a Red Banner card. Card Text: Additional abilities and rules of the card are written in this area. Flavour Text: The flavour text, always written in italics, has no impact on the rules of the game. Like the card art, it is there for interest's sake, adding to the artistic appeal of the game. Combat Statistics: The value on the left in the red circle is the unit's attack (ATK) value. The value on the right in the green shield is its defense (DEF) value. These values are used when a card engages in combat. Footer: The footer contains information about the game, and the card's "collector's number" and version. Identifying the card's faction, the player pays the card's faction power cost by marking the corresponding amount of unmarked resource cards of that faction. The card is put into play if it is resolved. Note that the marked resource cards are considered consumed for this turn, and may not be used to provide power for other plays. Even if the card should end up not being resolved (played)--which might occur due to interplay of rules--the spent power is not recovered or refunded during the same turn. Prerequisites written on a card are often unique to the card. They vary highly from card to card. Example prerequisite: "This card can only be played if you control fewer creatures than your opponent(s)." The battleground (the kitchen table :-) ) is divided into several areas. Below is a depiction of the proper table setup for one of the players in a game. Each player should have the same table layout in front of them. When you build a city you place it in your Kingdom area. When creatures visit the city they become residents of that city and are placed on the same imaginary row as the city. Cities are peaceful places, so residents of a city can not launch attacks, but they defend their city bravely when attacked. Creatures that will help launch an attack or defend against enemy attacks must be in your Army area, face up. Each faction in your deck has its own vault of resource cards. This area is where the deck resides and from where you draw new cards every time it becomes your turn. The area where all the discarded, used up, wasted or killed cards go. These might be, for instance, dead creatures, or used event cards. All cards in the graveyard are to remain face up, and any player may search through any player's graveyard at any time. Cards in a graveyard must remain stacked in the order that they enter the graveyard: first discarded (or used, etc.) card on the bottom, most recently discarded on the top. The area is where your remaining unbuilt cities lay dormant. Skip your turn to place one of these in your kingdom. Not really an area, these cards you hold in your hand. Before playing the game, each player selects the three cities form his/her deck and puts them in a separate stack on the table in the Kingdom area, face down. All players may shuffle any decks afterwards. Each player then draws 7 cards from his/her deck, to hold in hand (not showing to the other players). The game is played using individual player turns, that are divided into different phases. Agree on a method to choose which player will go first. The player going first looks at his stack of city cards, picks one and puts it on the table in the Kingdom area, face up. Then the following player does the same and this is repeated until every player has one city out. Then the first player's first turn it up. The player who is currently taking his turn is named the active player. All other players are termed passive players, even if they happen to do something (such as play Event cards) during the active player's turn. The term "the player" usually refers to the active player. In cases when the active player is not the player referred to, the terms "passive player" or "any player" are used. The Play and Attack phases are optional phases. You may choose to take no action during an optional phase. The phases must occur in the given order. You can't, for example, enter a Play phase once you have finished the Discard phase of your turn. The resources cards are thereby replenished, and ready for re-use. If the player has no cards in hand, (s)he must draw at least one card. The player draw all cards at once, then plays the resource cards. The Play phases allow the player to use creature abilities or play any card (s)he wants to. Creatures may be moved (see #Movement). Players may take as many actions as they wish during Play phases, providing that they have the resources and cards to do so, and requirements for actions are met. A player may choose not to do anything during a Play phase (i.e. skip that Play phase). During this phase the active player's Army may attack one city. A player may elect not to attack during a given Attack phase. If the player has more than 7 cards in his/her hand, the player must discard cards from her/his hand until there are 7 cards remaining in hand. A player may not discard cards from his/her hand if he/she has fewer than 8 cards in hand. There are 5 different card types: #Creatures, #Cities, #Events, #Magic, and #Enchantments. Creatures are the backbone of every army, they are the courageous forces that will bring a player glorious victory (or a miserable defeat that is best forgotten). All creatures also belong to one or more creature types. Creature types are words separated by spaces in the card's type lines. An example of a couple of creature types a creature could have is: Leader Beast Caster. Leader would be one, Beast another type, and Caster a third creature type. They don't necessarily relate to each other in any way even if it may look like it in some cases. Creature types are relevant in many situations when other cards interact with the creature cards. During the play phase a player may put new creatures into play by paying their power cost and then placing them into a city the player controls. Creatures may not be put into the Army directly, but they might be moved from a city to the Army at a later stage in the game. Creatures that are part of the Army can attack the opponent, as well as defend against enemy forces. Creatures that are part of a city are only able to defend against attacks on the city; they may never participate in an attack. Attack (ATK): The amount of damage the creature will inflict on its enemies in a single attack. Defense (DEF): How much damage a creature can take before it becomes wounded and dies. When a creature suffers damage equal to or greater than its Defense during a single turn, the creature is put in the Graveyard (of the creature's owner), along with all cards attached to it. Inflicted damage does not carry over to the next turn: If a creature was not put into the graveyard, it regains its full Defense strength at the end of the turn. When other cards manipulate these combat values, they are often paired and written in the form ATK/DEF. Example: +5/-2 would mean that a creature's attack would increase by 5, and its defense would decrease by 2. Creatures may have additional abilities giving them advantages (or disadvantages). Sometimes abilities only take effect when certain prerequisites are met or costs paid, such as marking the card. A card's abilities and any requirements thereof are written on the card. There is an extensive list of abillities and they are further described in the Abilities section, below. A given city may be involved in a move only once per turn (either as the origin or the destination of a move). However, this limitation does not apply when moving creatures out of a destroyed city (see #Defending a city). A player may only move his/her own creatures, and only among his/her own Army and cities, unless a card's abilities or effects allow otherwise. place it in the destination area. Cities are the heart of your kingdom, and give you tactical advantages over your opponent. A city belongs to a faction, and is to be placed in your Kingdom area, face up, visible to all players. All players begin the game with one city in play. However, a player may skip an entire turn and instead pick one of his/her unused cities and put it into play, face up. When a creature or player is in the city it is considered a resident. The city has a defense strength. When an opponent's army attacks your city, your residents may help defend the city. Additionally your Army can help defend the city. During the course of the attack the Army's creatures that are allowed into the city are residents of the city. Any left over unblocked attacking creature deals damage to the city. Damage dealt to a city is permanent and the lost defense strength is not restored after the turn. (You can keep track of the city's defense strength by placing 20-sided die beside it). When the city's strength is reduced to or beyond 0, it is destroyed, and its owner must put it in her/his Graveyard. Unmarked residents of a destroyed city must be moved to another city or to the army (see #Movement). Marked residents of a destroyed city return to their owner's hand. All other cards (e.g. enchantments) are put into their owner's Graveyard. When all of a player's cities in play are destroyed, that player is defeated. Cities can provide tactical advantages when they reach a certain level of devoted residents. During the player's Tactics phase, he/she can mark any number of residents to indicate their devotion to the the city. The city's current devotion is the sum of all loyalty marks given by all devoted residents. When it reaches the level indicated on the city card, the advantage is active. Cities may have multiple devotion levels, triggering stronger advantages. The active player chooses the order of the cities and are then resolved one by one. For a given city he/she declares all the creatures that will show their devotion to the city (all at once). Any player may react to that (e.g. killing one of the declared creatures). Finally the declared creatures are marked, and the devotion is calculated. For each city level reached, the advantage is triggered (mandatory). They are resolved in order, lowest levels first. An advantages can be one time action (e.g. drawing a card, return a card from the graveyard), or have a permanent effect. The city's devotion must be renewed every turn (since during the unmark phase all creatures, including the devoted residents are unmarked). If it is not renewed any permanent advantage fades out. Once a city is destroyed, the owning player may no longer enjoy the advantage. Event cards represent one-time effects. When an event card is played, its resolution is determined and its effects occur immediately. In CCG terminology these are commonly known as interrupts or instants. Any player may play an event card at any time, even during an opponent's turn. When an event card is played (cast), its effects are not taken into account immediately; the opponent is given the chance to react and play an Event card in response. After an event card has been used, it is discarded the same turn it was played. The owner places it in his/her Graveyard. When an event card is played, it is placed on an imaginary stack. Its effects are not yet taken into account. All players (including the originating player) have the opportunity to play an Event card in response, it is placed on top of the imaginary stack. Its effects are not yet taken into account. This action-reaction process is repeated until all players stop playing additional Event cards. The top card on the imaginary stack is now resolved, and its effects occur. In short, the last played card's effect is applied first. At any time, new event cards can be played. Magic cards may only be played during the player's own turn, and only during a Play phase. Once a magic card has been played, it is discarded into Graveyard. Enchantment cards may only be played during the player's own Play phases. Enchantments may have a target. Global enchantments (without a target) are placed in the Army area. Enchantments remain in play until some effect removes them, potentially across many phases and turns. When an enchantment is removed, the enchantment card is placed into the owner's Graveyard. When a card is legally moved from hand, main deck, cities deck or grave onto the game table it is entering play, and if nothing hinders it the card is then in play. All cards that have been paid for, if any, are considered to be in play. Typically that would be all permanents that are on the table, like your creatures and enchantments. Events, effects of abilities and Magic are technically speaking also in play for a very short moment: They enter play, are in play, resolve and then become discarded into the graveyard - leaving play. Cards in play are always in either a marked or an unmarked state. Cards not in play cannot be marked or unmarked. Cards come into play in the unmarked state, unless the rules of some card used in the game clearly specify otherwise. The marked state is normally used to show that a card has been exhausted or used somehow. Examples of when a card becomes marked: When a creature attacks, moves, or uses an activated ability that requires it to mark. To mark a card, orient it horizontally (landscape, as opposed to portrait). A marked card cannot be marked again. Only an unmarked card can be marked. Some effects or rules can unmark a marked card. There is no limit on how many times a card can become marked or unmarked if these state changes happen legally as a result of effects. Each player gets all of his/her marked cards unmarked during her/his own unmark phase of his/her turn. Some actions, abilities and rules require a card to be marked when the player wants to use it in a particular way. Marking is not a cost. It should rather be seen as a kind of prerequisite, an action that needs to happen in order for an effect to happen. Whenever the mark me symbol is shown (a horizontal rectangle with a symbol within, ) it means that you have to mark the card itself if that is a prerequisite for whatever you're trying to accomplish. A card that is not in the in play state is considered to be not in play. All the cards in a players hand, main deck, cities deck and grave are examples of cards that are not in play until their owner pays their play cost and meets any other requirements so that they can be put in play. There is a distinction between being "in play" and "was played". Card types that can stay on the table (permanents) are put "in play". Cards that don't stay on the table after they "were played" are not considered to be "in play" after they are played. For example, an Event card that is discarded immediately after the player tries to trigger its effect is not considered "in play". A card that has been removed from the game is in a state distinct from the in play and not in play states. A card removed from the game ceases to exist for all intents and purposes for the remainder of the game. Removed from game cards are not placed in the Graveyard. They are to be placed in a pile more distant from the game, since there will be no interaction with them while playing. There is a huge difference between cards not in play and cards removed from the game: Cards not in play are still a part of the game and might come into play at some point. Cards in hand or in the deck or even in the grave are examples of cards not in play. In contrast, cards that have been removed from the game may never in any way become part of the current game. Only unmarked creatures may attack or defend. The active player is the only one that may perform attacks, and only during his/her Attack phase. When attacking, the player must use one or more creatures in his/her army and declare the target of the attack: one of the opponent's cities. Only the attacked player may employ his/her creatures in defense of an attack. Other players may not lend their forces to defend. Combat is resolved on a per attacker basis: Each attacker (together with all its blockers) is part of one single and specific battle. The order in which battles are resolved may affect the outcome of other battles or states in the game. Before combat begins, the attacking player decides and announces the order in which the attacking creatures will assault the opposition. The defending player must decide if or how (s)he will defend, and which creatures (s)he will assign to defend against which attacking creatures. The attacking player must declare his/her full attack plan before the defending player declares her/his defense strategy. The attacking player may not change his/her attack plan (by switching targets, or adding or removing creatures from the assault) once the defender has begun declaring her/his defense plan. The attacking player may choose to attack during his/her Attack phase using any number of unmarked creatures in his/her Army (or may choose not to attack). The attacking player chooses which creatures will fight in the current turn by marking them and announcing them as attackers. All attackers must be openly identified to all players before the attack occurs. The attacking player declares the city which will be attacked. Players may not attack their own cities. Event cards can be played by all players (e.g. to boost a creature's attack strength, or to kill a creature before it can attack). The owner of the city being attacked is the defending player. The unmarked creatures in the defending Army are always available to defend. The unmarked creatures in the attacked city are also available to defend. The defending player chooses which of these available unmarked creatures to use as defenders. The defending player may elect not to defend against the attack at all. A given defender can only defend against one single attacker. Several defenders may be assigned to the same attacker. An individual battle is comprised of one attacker and its assigned defender(s). The attacker receives damage equal to the sum of the ATK values of the defenders. If the damage is greater than or equal to the attacker's DEF value it dies. The attacking player chooses how to distribute the damage dealt by the attacker's ATK strength among the defenders. If a defender receives damage greater than or equal to its DEF value, it dies. Damage to the attacker and its assigned defender(s) is resolved simultaneously, hence the attacker and one or more of its assigned defenders could die in a single battle. If an attacker has no defenders assigned to it, then the attacked city loses Defense strength equal to the total amount of damage dealt by the attacker. If any defender engages an attacker, the attacker does not reduce either a city's Defense strength by any amount during that attack, even if the defender is killed by the attack. When combat is over, each dead creature is placed in its owner's graveyard. As in many games, some rules and mechanics may seem to contradict themselves at times. This is actually a feature and what makes CCGs deep, complex and modular. If a card's rules contradict the core rules (in this document), the card's rules override the core rules. If an effect forbids something, while another effect allows it, that something is forbidden. "No, not, can't" etc. always outweigh "can". Example: A creature has the effect "can not fly" in its card text. Playing a Magic card on the creature with the text "target creature can fly" does not make the creature able to fly. The "can not" overrides the "can". Many creatures have special skills, and some are able to perform different kinds of actions. There are numerous ways in which creatures can interact with one another without engaging in standard combat. These skills are called abilities, regardless of what they do, and whether they have drawbacks or not. There is an extensive list of abillities. Abilities are not limited to just creatures. Some Magic cards can grant creatures additional abilities they wouldn't otherwise have. There are three main types of abilities: passive, activated and triggered. A passive ability is one that takes effect and abides without needing any associated cost to be paid, any action to be taken, or any particular requirements to be met. As soon as the object with the ability enters play, the ability is active. It ceases to affect the game when the object leaves play. Example: "All Elvish creatures get +3 Defense" is a passive ability. A card's ability only takes effect after the player controlling the card pays the ability's cost. Inability or refusal to pay the ability's cost prevents the ability from taking effect. Only the controller of a card may activate it's abilities. Usually, the controller is the player that put the card in play by paying for it. There are three types of costs that must be paid to activate abilities: power cost, marking and custom cost. Whatever is on the left side of the colon (:) are the cost(s) or prerequisites. The text on the right side of the colon is the card's effects that will occur once the costs are paid and the prerequisites are met. A triggered ability is activated if and only if its trigger takes place. Players cannot choose whether a triggered ability will take effect or not once it is put into play. It must take effect once the trigger ocurs. It is possible for rules or situations to prevent a triggered ability's effect from applying. Consider the triggered ability "Discard a non-Dark-Legion creature every time a skeleton comes into play." Suppose an opponent plays that curse (triggered ability) on you. If any player (including you) puts a Skeleton type creature into play, then you must discard a non-Dark-Legion creature. If you have only Dark Legion creatures, however, then it is not possible for you to comply with the card rule, in which case you don't have to discard anything. This card costs X resource cards. Some cards have a cost of X instead of a literal number. Other cards have a cost of X with a modifier (usually a simple algebraic expression). In these cases, the meaning of X is always defined in the card text. A card costs X + 2. Its text says that X is equal to the ATK value of the target creature. The target creature's ATK is 3. Thus, the cost to play the card would be 3 + 2 = 5 resource cards. At the time of this writing, these rules are only intended for developers that work on the same ruleset as ngoeminne, which is dubbed "the Awesome Rules Concept", or ARC for short. Edits are allowed by anyone as long as they fully maintain the semantics and logic of the game, the intention of the edited rules, etc. Such edits should not change how the game is played. Rule-changing edits are allowed only after being cleared with ngoeminne first. The ARC intends to live up to the General Design Document & the Local Design Document for the ORC. All content in here can and will likely change as development, concept testing, play testing and revising continues. At the time of this writing, nothing in this document represents the finalized game. These rules should not (at this time) be seen as set in stone. Questions? Please post them in our forum after mailing us for an account in there; or mail your questions. Arcmage is a free open source card game, developed and guided by the wtactics.org open source card game platform. See our detailed license information. Join us and participate in playing, testing, designing, and creating an open source card card game.